The aroma of cinnamon rolls baking away in the oven is one of the more delightful and enjoyable small pleasures I can think of. Especially on one of the first chilly days of the season. 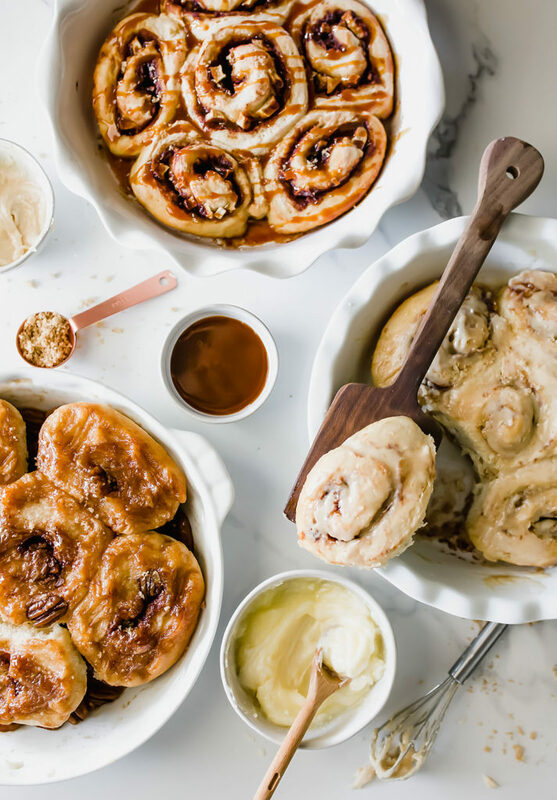 I’m obsessed with cinnamon rolls and even more than that, obsessed with dreaming up new flavor twists to the classic cinnamon roll. I’m using the same basic base for each flavor: my Ultimate Simple Dough recipe! 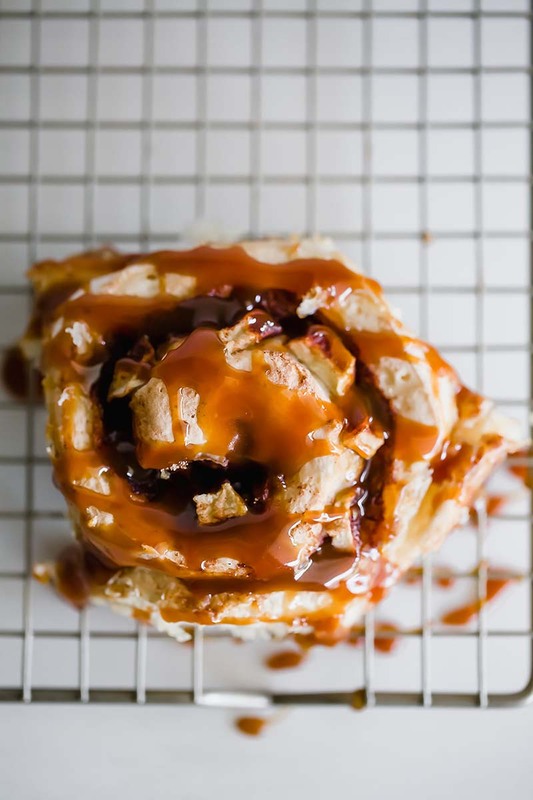 You can actually use this dough to make anything from dinner rolls to pizza and sandwich bread, but they’re also perfect for cinnamon rolls of any kind! If you’re intimidated by baking with yeast dough, don’t be. This Ultimate Simple Dough recipe was designed to be as foolproof as possible! Especially if you make it with Red Star Platinum Superior Baking Yeast, which is so easy to use. It actually strengthens and improves your dough to create super fluffy rolls! There are even more tips for making homemade dough in that recipe post, so be sure to check it out. Each filling varies slightly depending on the flavor you’re following. But what I’ve found is that the more butter + cinnamon the better! That makes for the most gooey and flavorful rolls possible. But feel free to get creative experimenting with the filling. As opposed to the base dough, the filling is a little more forgiving! To get started, make a batch of that Ultimate Simple Dough and let it rise once. After you assemble and shape the rolls, cover them and let them rise again for 30 minutes to 1 hour. The time required will depend in part on the temperature and humidity of your kitchen. Cinnamon rolls are best served fresh and still warm from the oven. You can get away with storing them for a day, covered at room temperature, then re-warming them before serving. Refrigerate assembled and shaped rolls after they have risen for 20 minutes. Cover the rolls tightly with plastic wrap and refrigerate for up to 24 hours or freeze for up to 2 months. If freezing, allow to thaw in the fridge overnight. Loosen the plastic wrap and allow to finish rising and lose its chill at room temperature until an indentation made with your finger into the dough remains. Preheat the oven during this period then bake as directed. Serve the banana bread and caramel apple rolls warm or at room temperature. The sticky pecan rolls must be served warm or the pecan topping begins to harden. 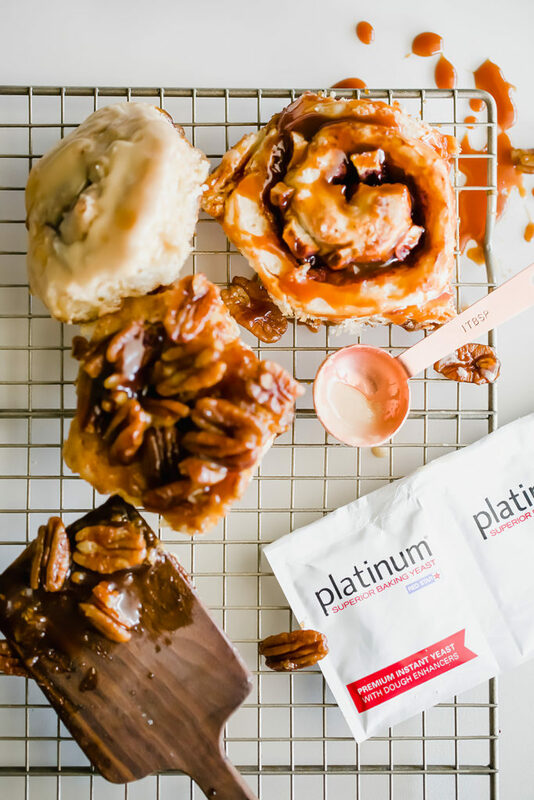 Let the pecan rolls stand for 2 to 3 minutes after baking before placing a tray or serving plate upside down onto pan. With oven mitts on, carefully turn tray and pan over. The pan will be hot!! Let pan remain 1 minute so caramel can drizzle over rolls before pulling the pan away. 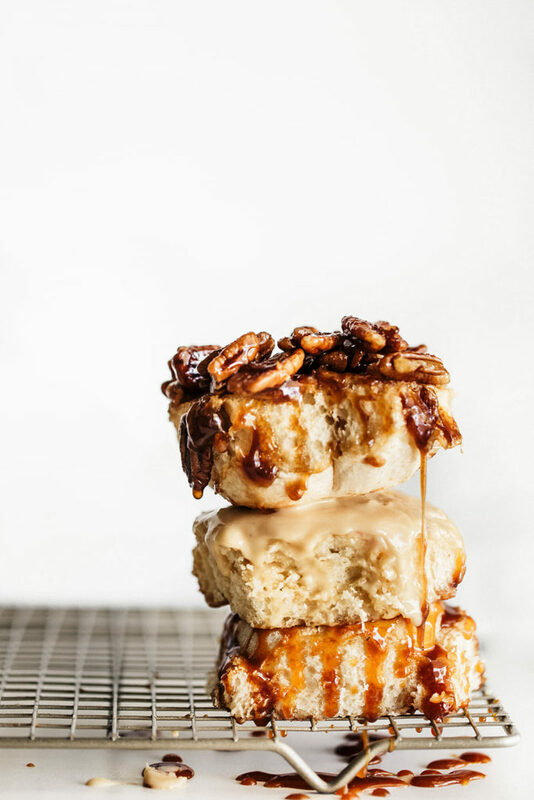 Sticky, gooey homemade pecan rolls made from a simple homemade dough. In a small saucepan, melt the butter. Add the sugar and bring the mixture to a boil, stirring constantly. Remove from heat and stir in the corn syrup. Pour mixture into baking pan. Sprinkle with pecans. In a small bowl combine all filling ingredients except the butter. Generously grease two 9-inch pie pans or one 9 by 13-inch baking pan. On a lightly floured work surface, roll the dough out into a 9 by 15-inch rectangle. Brush the butter all over the dough, leaving a ½-inch border at the far edge. Sprinkle the filling all over the buttered dough. Roll the dough up tightly then press the seam to seal. Use a sharp serrated knife to cut the ends off, and then slice into 12 equal pieces. Place in prepared pan(s). Loosely cover and allow to rise for 30 minutes to 1 hour, or until puffy. Bake at 350°F for 25 minutes, or until golden brown. Let stand for 2 to 3 minutes before placing a tray or serving plate upside down onto pan. With oven mitts on, carefully turn tray and pan over. Let pan remain 1 minute so caramel can drizzle over rolls before pulling the pan away. Serve warm. In a small bowl, combine the sugar, cinnamon, nutmeg, and salt. Brush the butter all over the dough, leaving a ½-inch border at the far edge. Sprinkle the sugar mixture all over the buttered dough. Add the apple pieces in an even layer. Drizzle the caramel all over. Roll the dough up tightly then press the seam to seal. Use a sharp serrated knife to cut the ends off, and then slice 11 to 12 equal pieces. 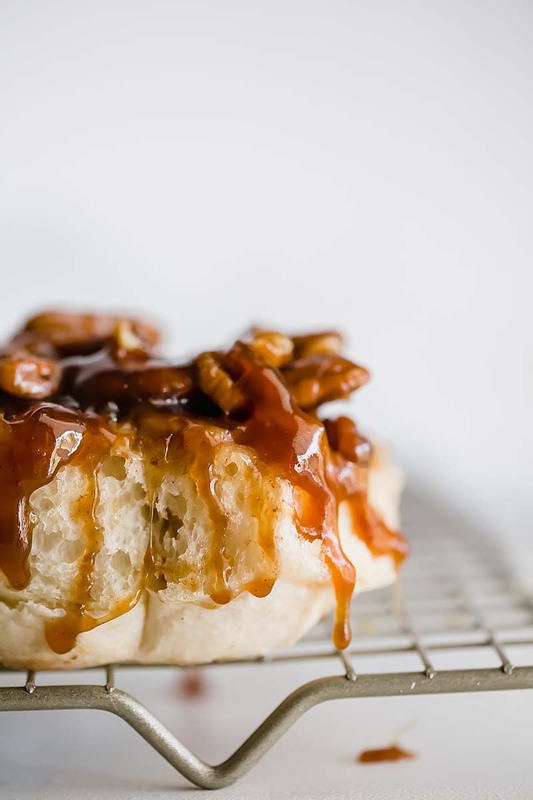 Drizzle the caramel over the warm rolls. Serve! Everything you love about banana bread, wrapped up in a soft & fluffy simple dough. In a small bowl, combine the sugar, cinnamon, and salt. Brush the butter all over the dough, leaving a ½-inch border at the far edge. Sprinkle the filling all over the buttered dough. Arrange the banana slices in even rows, spacing each row a couple inches apart, over the dough. 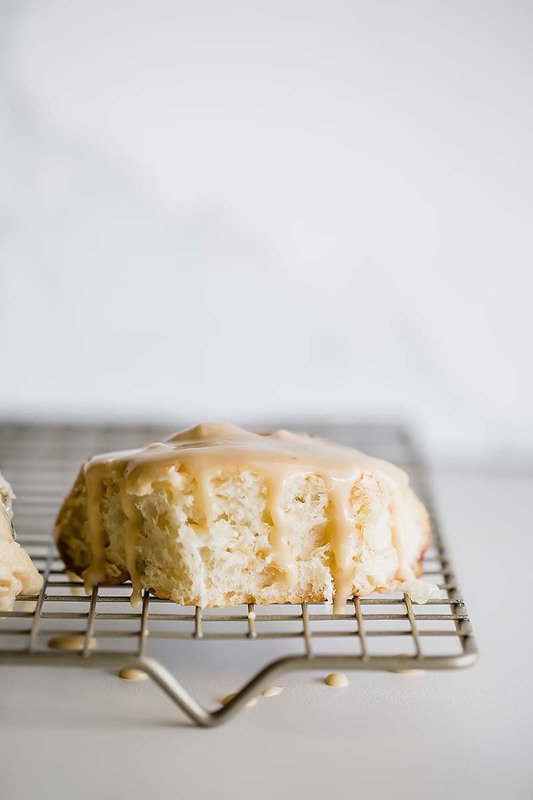 In a small bowl, combine the powdered sugar and maple syrup until a thick glaze forms. Drizzle over the warm rolls. Serve! Handle the Heat features homemade sweet treats with a sprinkling of science.